Orient Investment Company, formerly Orient Holding Company, is a shareholding company, operating in accordance with internationally accepted principles and provisions. Orient Investment Company is founded by a selected group of shareholders who are well versed in the financial, real estate, gold, forex and trade sectors. 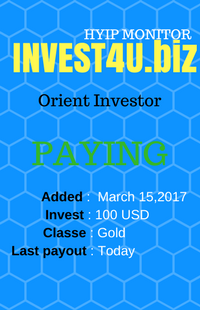 In the long term, Orient Investment Company aims to diversify its investments to global internet users . We are honored by your visit, and invite you to learn more about our company. Use our referral program and earn up to 30.00% of referral deposits!